Here are some positive stories from the world of plastics. The BBC plans to take away plastic cups and cutlery by end of this year. Currently, visitors and staff get through about 2 million plastic cups every year. bio-bean –Founded in 2013 by Arthur Kay, bio-bean manufactures a range of products from waste coffee grounds, saving businesses money, reducing greenhouse gas emissions, and displacing conventional fossil fuels. – reusing 200,000 tons waste coffee grounds. Simply cups – Simply Cups is the UK’s ONLY collection and recycling service dedicated to turning paper and plastic cups into second-life materials. Magazine wrappers – Some magazines are now being wrapped in potato starch bags rather than cellophane. Sainsbury’s wants to reduce its own-brand packaging by half by 2020 compared with the levels in 2005. M & S – Over 90% of all M&S packaging is recyclable in the UK. The company is looking at ways to improve the recycling of black trays that ready meals come in. While they are recyclable, their colour means sorting equipment cannot detect them, so the trays end up on landfill anyway. M&S launched a trial version of the tray using a different black colourant, which was sold in stores for a month. M&S is also exploring using plant-based materials for plastics, which have a lower environmental footprint and are recyclable. Co-op – By 2020, Co-op wants 80% of its products to have packaging that is easy to recycle. So far it has reduced the packaging for its protein products. Great moves – however, they all depend on people recycling the packaging and not throwing it in the hedge. 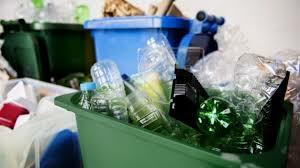 Conclusion – The answer is to use less of it and recycle as much as possible. – Reduce, Reuse, Recycle.